Here is an update from a story that we ran here a few weeks back. On Thursday, the Senate voted to give the District of Columbia voting rights in the House. The Hosue is expected to pass the bill, and President Obama is expected to sign the measure if reaches his desk. As promised, we are watching the story. I'll have more analysis of the issue on Monday. This week's Saturday Evening Review centers on Justice Ruth Bader Ginsburg, returning to the Court this week after surgery. Justice Ruth Bader Ginsburg returned to the Supreme Court bench yesterday with a wide smile and a long list of questions for the lawyers appearing before her, resuming her duties less than three weeks after surgery for pancreatic cancer. Ginsburg, who will turn 76 next month, smiled broadly as she walked into the courtroom with her eight male colleagues and turned slightly to look directly at reporters who chronicled her Feb. 5 surgery and diagnosis of early-stage cancer. 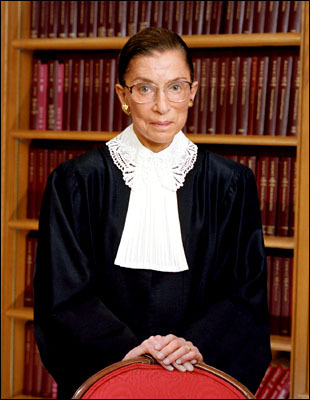 Ginsburg was surely aware that "reports of her death had been greatly exaggerated." Senator Jim Bunning (R-Ky) was widely quoted as saying that she had "bad cancer, not the kind you get better from" and predicted she would not live longer than a year. As the Wa Po reported, Bunning apologized saying "if my comments offended Justice Ginsburg" and said it was "great" to see her back at the court. During my battle with cancer, what saved me beyond anything, I will confess, is work. I was told that by my dear colleague, Sandra Day O'Connor, who had breast cancer some twenty years ago. Nine days after her surgery, she was on the bench listening to arguments. She told me that I should not miss a sitting if I could help it; that I should schedule my chemotherapy on a Friday so by Monday I would be over it. She told me to do whatever I could manage. Try to exercise as soon as you can, she counseled. If there are certain parts that won't move, then just move on to something else. Work, more than anything else, carried me through that year. I didn't dwell on my physical discomfort. I regarded it as a nuisance I had to live with. The important thing was understanding this case or making this opinion comprehensible. . . . So, I regarded work as my savior, and a family that rallied around me. . . . [When I returned to the Bench] I sat there listening to the arguments, just as I would any other sitting day. There was some magic or some super power that made that happen. 7 New York City Law Review 221, 239-40 (2004) (Check out this volume of the NYC Law Review for articles on Ginsburg's judicial philosophy as well as a comprehensive annotated bibliography of works by and work about Justice Ginsburg). Having witnessed those previous remarks, I was not surprised to hear that Ginsburg was an avid participant in all six arguments from this week, transcripts available at the US Supreme Court site here. Firearms and domestic strife are a potentially deadly combination nationwide. See, e.g., Brief for Brady Center to Prevent Gun Violence et al. as Amici Curiae 8–15; Brief for National Network to End Domestic Violence et al. as Amici Curiae 2–8. Yet, as interpreted by the Fourth Circuit, §922(g)(9) would have been “a dead letter” in some two-thirds of the States from the very moment of its enactment. 482 F. 3d, at 762 (Williams, J., dissenting). As of 1996, only about one-third of the States had criminal statutes that specifically proscribed domestic violence. Recall Gonzales v. Raich, 545 U.S. 1 (2005), in which the United States Supreme Court (6-3) construed the Commerce Clause to empower Congress to criminalize marijuana use regardless of state laws approving medical marijuana use. John Ashcroft, as the AG before Gonzales, had a fairly aggressive prosecution policy toward medical marijuana. Now, Eric Holder, Obama's AG, has announced that medical marijuana prosecution is no longer a priority. Huffington Post has video of the news conference here. The statement occurs without much fanfare. Senator Patrick Leahy, Chair of the Senator Judiciary Committee, announced three witnesses for an upcoming Judiciary Committee hearing on Leahy's proposal to establish a nonpartisan commission to examine national security policies, including detention and treatment of enemy combatants, in the Bush administration. Leahy invited Thomas Pickering, former Under Secretary of State for Political Affairs; Retired Vice Admiral Lee Gunn; and 9/11 Commission senior counsel and team leader John Farmer. The hearing will take place next Wednesday, March 4, at 10:00 am, and will be web-cast on the Committee's web-site. Several news outlets reported this afternoon that Ali Saleh Kahlah al-Marri was indicted today by a federal grand jury in Peoria, Illinois. The ACLU, which represents al-Marri, issued a press release anticipating the indictment. Al-Marri is the lawful U.S. resident who was held in indefinite military detention in the U.S. as an enemy combatant. The Fourth Circuit upheld his detention, and he appealed to the Supreme Court. The Obama administration was faced with the choice: Argue the Bush administration position at the Supreme Court, or charge al-Marri in a regular Article III court, or both. It apparently elected to charge al-Marri in a regular Article III court. Now the question is what the administration will do at the Supreme Court. Whatever position the administration takes, one obvious and likely possibility is that the Court will rule the case moot. The ACLU encourages it not to do this. It argues that the issues are critical, and a high court ruling will prevent this from happening again. The Justice Department's brief is due March 23; oral argument is set for April 27. We should know before either date whether the administration will press the case at the Supreme Court, or press to drop it. I'll keep my ears open. I most recently posted on the case here. Illinois AG Lisa Madigan issued an opinion yesterday concluding that there's nothing in the U.S. Constitution or the Illinois Constitution to prohibit the Illinois legislature from calling a special election to "fill" the U.S. Senate seat vacated by President Barack Obama and now occupied by Roland Burris. Thanks to my colleague and friend Walt Kendall for the tip. Recall that Burris was appointed by embattled (and now impeached and removed) Governor Rod Blagojevich. The initial appointment was controversial because of Blagojevich's then tenuous status as Governor and his shenanigans in filling the vacancy. I posted on this here, here, here, and here, arguing that the Senate lacked power to block a valid appointment under the 17th Amendment and Illinois law, 10 ILCS 5/25-8, whatever we might think about Blagojevich, Burris, or the whole stinking process. Now in the wake of revelations of Burris's, er, complementary statements about his ties with Blagojevich prior to his appointment, folks here in Illinois are looking for other ways to remove him, particularly a special election to "fill" the "vacancy." AG Madigan opined that nothing in the U.S. Constitution or the Illinois Constitution prohibits that. She concludes that if anything the 17th Amendment prefers it. When a vacancy shall occur in the office of United States Senator from this state, the Governor shall make temporary appointment to fill such vacancy until the next election of representatives in Congress. Madigan argues that the last clause of the 17th Amendment--"until the people fill the vacancies by election as the legislature may direct"--allows the legislature to rewrite 10 ILCS 5/25-8 to call for a special election for the seat temporarily occupied by Burris. This all seems to make good sense. Except that there isn't a vacancy. The 17th Amendment doesn't even come into play unless there's a vacancy, and here there is none: Burris is the validly appointed U.S. Senator from Illinois. (Madigan even refers to him as "Senator Burris" in her opinion.) Nothing in his "temporary" appointment takes away from the fact that he currently fills the seat. The 17th Amendment has no more relevance to Senator Burris's seat than to Senator Durbin's seat. Madigan seems to assume that Burris's "temporary" appointment means that the seat is still vacant, or at least somehow more vulnerable for purposes of the 17th Amendment and Illinois law. But this position is wholly belied by the plain language of the 17th Amendment and Illinois law, 10 ILCS 5/25-8, which together mean that any "temporary" appointee is for all purposes a U.S. Senator. At the very least, those authorities mean that any "temporary" appointment fills the vacancy (at least temporarily!). Sure the Illinois legislature could have--even should have--amended 10 ILCS 5/25-8 to provide for a special election when the seat was still vacant. Everything in Illinois politics at the time suggested that that was the prudent move: This simple change could have avoided the whole Blagojevich appointment mess. But the legislature didn't do that. And Blagojevich appointed Burris--legally, validly--under the 17th Amendment and Illinois law. The seat is now filled; there is no vacancy; and the 17th Amendment doesn't come into play. It certainly doesn't permit a special election. Another new book on Marbury v. Madison, The Great Decision: Jefferson, Adams, Marshall, and the Battle for the Supreme Court by Cliff Sloan & David McKean. "Former Supreme Court clerk and Slate publisher Sloan and veteran political aide McKean bring to life one of the most important legal cases in American history.... Sloan and McKean supply Marbury's historical context and unravel the complex fabric of personalities, politics and law that animated the case.... The authors' enthusiasm and clear prose vivify the contention that, as Marshall said, 'It is emphatically the province and duty of the judicial department to say what the law is.' A crisp, color examination of the case that established the formidable power of the federal judiciary." Cliff Sloan also made a brief appearance on the Colbert show last night (February 24) to talk about the book and Marbury v. Madison. The short video might be good for class use and is available here. In the segment, Colbert remarks that judicial review is not in the Constitution and that the Court gave itself the power, calling Marshall the original activist judge. As part of the materials in support of Johnsen's appointment, the Committee considered several letters from law professors, including Johnsen, submitted to the Judiciary Committee in the Bush administration and Johnsen's testimony before the Committee on "Secret Law" in the Bush administration. If you haven't seen (or signed) these, take a look. The first letter (July 9, 2007) responds to the Bush administration's Statement of Administrative Policy on The Local Law Enforcement Hate Crimes Prevention Act of 2007. The SAP raised concerns about Congress's authority to enact the law, which would have prohibited violent crimes motivated by the race, color, religion, or national origin of the victim. The letter set out the case for why Congress had authority under Section 2 of the Thirteenth Amendment. These provisions [Article I, Sec. 8 authorities related to war] plainly set forth an extensive role for Congress that goes far beyond the initial decision to declare war and subsequent decisions regarding its funding. This mass of war powers confers on Congress an ongoing regulatory authority with respect to the war. Indeed, these powers are so extensive that Chief Justice John Marshall opined (with some exaggeration, when read out of context) that "[t]he whole powers of war [are], by the Constitution of the United States, vested in Congress . . . ." As Commander in Chief, the President's role is to prosecute the war that Congress has authorized within the legitimate parameters Congress sets forth. Congress has exercised precisely this power to define the parameters of armed conflict or war on a number of occasions, some of which concern recent military engagements. There are circumstances, of course, in which the executive branch should keep OLC advice secret. In extreme cases, the release of an OLC opinion could gravely imperil national security. Congress should respect the President's genuine needs for secrecy. But so, too, should the President respect Congress's need to know how--even whether--the executive branch is enforcing existing law. It is fundamental that if OLC advises the executive branch that it may disregard an applicable legal restriction--whether in the Constitution, a treaty or a statute--because a presidential prerogative trumps the law, OLC virtually always should make that legal interpretation public. Johnsen's testimony incorporates the famous Principles to Guide the Office of Legal Counsel, authored by 19 former OLC attorneys. This material has been around a while, and nothing in it is a particular surprise, but it makes great reading on a wide range of hot-button issues from the Bush administration. Some of the jurisdictions covered by Section 5 now want to be released from this form of federal receivership. As the lower court in the case put it, the plaintiffs argue that the preclearance provision should be found unconstitutional "because Congress 'irrationally and incongruously' chose to continue imposing 'disproportionate' burdens and a 'badge of sham' on covered jurisdictions on the basis of an 'ancient formula' and 'conditions that existed thirty or more years ago but have long since been remedied.'" What is the proof? The plaintiffs stated it in the first line of their brief: "The American that has elected Barack Obama as its first African-American president is far different than when Section Five was enacted in 1965." Toobin responds by exploring racialized voting patterns among whites in Section 5 jurisdictions in the 2008 election and the variety of hassles that blacks have disproportionately endured in every recent national election. But two important components of the case are missing from this back-and-forth. First, Northwest Austin MUD faces an significant uphill battle in its facial challenge of the VRA at the Roberts Court. The Court has raised the bar for facial challenges in other election law contexts, and there's no reason to think that its high hurdle won't apply here. Second, MUDs in general are hardly models of democracy. In fact, they often operate in ways that ought to make us grateful for federal oversight via Section 5 of the VRA. Professor Sara Bronin (U. Conn.) wrote about the problems with MUDs; I posted on her article here. If the Court is true to its trend on facial challenges, it will look to the evidence before Congress in its reauthorization hearings and ask whether Northwest Austin MUD has shown that reauthorization is not proportional and congruent to the evils of voting discrimination in every conceivable case where Section 5 applies. This italicized language is the high bar--or the thumb on the government's side of the scale--that the Court set in its recent jurisprudence on facial challenges. But even if the Court backs off this standard and treats the case more like an as-applied challenge, a Texas MUD may not be the ideal political subdivision to take on Congressional authority to reauthorize Section 5. Election practices in both Texas and the Northwest Austin MUD could go under the microscope, and the results may not be pretty. I previously posted on the case here. Professor Clare Pastore (USC) published an op-ed in the LA Times yesterday arguing for a right to counsel for indigents in eviction proceedings, employment and healthcare disputes, custody proceedings, and other disputes involving basic human needs. Every day, Americans without access to legal counsel unnecessarily lose homes, jobs, retirement benefits, healthcare and custody of their children. This is because in American, we have not yet recognized a right to counsel in civil cases, except in a tiny number of narrow areas. Indigent clients with the law on their side often find themselves losing to well-funded opponents simply because they have no means of fighting back. The problem is particularly acute in the current housing and financial crises. I previously posted on this here, with links to the ABA, the Brennan Center, and the National Coalition for a Civil Right to Counsel. Tuesday, Feb. 24, is the 206th anniversary of Marbury v. Madison, the most important decision the Supreme Court—and perhaps any court—has ever issued. The late chief justice William Rehnquist hailed it as "the most significant single contribution the United States has made to the art of government"; nations around the world look to Marbury as they work to create institutions that will protect the rule of law. As the United States thinks anew about its commitment to these rules, it would serve us well to draw on the wisdom of this landmark decision. Also from the Newsweek site is an image of "remnants of a court order served to Madison in 1802, from the National Archive." The administration on Friday declined Judge Bates's (D.D.C.) invitation to "refine" the Bush administration position on whether the privilege of habeas corpus extends to the U.S. Airbase in Bagram, Afghanistan. I posted most recently on this here. In a habeas claim of a Bagram detainee before the D.C. District, Judge Bates gave the Obama administration until February 20 to reconsider that position. The administration on Friday declined to change. This was one of several closely watched decisions in the early days of the Obama administration that would signal the extent of the changes we might see in the war on terror and assertions of executive authority under President Obama. By this measure, the decision Friday was a disappointment to those who hoped to see significant changes. But this issue--whether habeas extends to overseas detention facilities within a theater of active combat--is perhaps the least controversial among the several recent and imminent decisions of the new administration: The claim here--that habeas does not extend to Bagram--is more strongly rooted in practice and precedent than nearly any other significant Bush administration claim now before the courts. The Obama administration's decision in this case shouldn't be understood as merely maintaining the Bush administration policy, because the policy here may be most faithful (among the several policies now before the courts) to the law. The administration's recent decision on the State Secrets Privilege and its forthcoming decision on Executive Privilege are far greater defining issues for the administration. On the former, of course, the Obama administration recently decided to maintain the Bush administration position. We'll see what happens within the week on the latter decision. See here for more on changes in the war on terror and assertions of executive authority in the Obama administration. Ted McClure reviewed Adrian Vermeule's Our Schmittian Administrative Law on our sister blog, the Administrative Law Prof Blog; check it out. What Professor Vermeule examines is where to draw the line, if that is possible, between routine executive action where administrative law writ large is appropriate and emergencies where something else is needed. Further, he looks at what that something else really is. This paper clarifies these questions and concludes that there are no real answers possible. Emergency powers, crisis government, and Schmitt have gotten some attention after the 9/11 attacks and the more recent financial crisis. I previously posted on Posner and Vermeule's related Crisis Government in the Administrative State: 9/11 and the Financial Meltdown of 2008 here. Hasen on "The Democracy Canon"
Professor Rick Hasen (Loyola/LA and editor of the Election Law Blog) just posted "The Democracy Canon" on ssrn. This is Hasen's latest in a long line of impressive scholarship on election law, and it's every bit as thoughtful, timely, and important as his previous work. I highly recommend this piece. In mid-September 2008, two Ohio controversies garnered national attention. In one case, Republicans filed suit to block first-time Ohio voters from registering to vote and casting an early in-person absentee ballot at the same time during an apparent five-day statutory overlap between the dates for voter registration and for early voting. In another case, Republicans sued the Democratic Ohio Secretary of State, Jennifer Brunner, for her refusal to accept absentee ballot requests submitted by voters who filled out a form sent to them by the McCain campaign unless the voter had checked a box confirming the voter was qualified to vote. The box, mistakenly added by the McCain campaign, was not required under Ohio law. My initial reaction to the lawsuits--before I had chance to examine the relevant Ohio statutes--was that Republicans should lose the first case and win the second. That is, I entered into the statutory analysis with a thumb on the scale of voter enfranchisement. Hasen's thumb is the Democracy Canon. Hasen shows that the Canon "has long and broad support in state courts, from cases in the 1800s through those decided in the 2008 election season," even if federal courts haven't yet caught on. It's been applied in three kinds of cases: vote counting cases (i.e., those involving a request to count uncounted votes after an election); voter eligibility and registration cases (i.e., cases involving a challenge to a denial of the franchise for a voter or group of voters); and candidate and party competitiveness cases (i.e., those involving a candidate's or party's appearance on the ballot). should be honest and clear when the canon plays a role, and educate the public both on the longstanding nature of the canon and on the ability of the legislature to avoid court reliance on the canon through clear statements about the strength of deadlines and other election law rules governing voters and their choices at elections. In perhaps the most interesting and most important section, Hasen argues that federal courts should defer to state courts applying the Canon. "Only when a state court relies upon the canon in a way that counters longstanding practice should a federal court consider intervening in a state court election case on constitutional (likely due process) grounds." For the most part, concerns about overreaching should be addressed ex ante by the legislature: A state legislature concerned about state court application of the Democracy Canon in the context of federal elections can use clear statements to negate its application . . . . In an age where "voter rights" increasingly means the right to exclude suspicious voters from the polls, Hasen's piece is a pleasant reminder--and a good argument--that state courts have a long tradition of expanding the franchise, not contracting it. And based upon this tradition, Hasen makes a strong case as to why the federal courts should defer to state courts applying this tradition. If future elections follow the same trends we've seen since 2000--and there's no reason to believe they won't--Hasen's argument could even be more important. This is an excellent piece; I highly recommend it. The Olin/Searle Fellows in Law program will offer top young legal thinkers the opportunity to spend a year writing and developing their scholarship with the goal of entering the legal academy. Up to three fellowships will be offered for the 2009-2010 academic year. Stipends will include $50,000 plus benefits. While details will be worked out with the specific host school for the Fellow, in general the Fellow will be provided with an office and will be included in the life of the school. More info and details here. ConLaw Profs tend to be under-represented in programs on law teaching and academic success - - - here's a chance to get involved. I did a workshop at this year's AALS joint program with academic support and teaching methods (described here) and not only enjoyed it immensely, but learned a great deal from the other presenters. Plus, this is a fun group with which to work. Here is this year's call, proposals due March 9. The AALS Section on Academic Support will showcase how professors are transforming the learning environment of their classrooms through innovative and creative methods. Many of these methods have their roots in traditional academic support tenets of varying lesson plans to reach different learning styles, providing feedback throughout the semester, assessing students in creative ways, engaging students both in and out of the classroom, and encouraging students to take responsibility for their own learning. The committee requests proposals that demonstrate modern classroom and teaching techniques including but not limited to: active learning activities, teaching assessment procedures, exam drafting, skills development in doctrinal courses, and innovative lesson plans. Show us what’s new and different in legal education in the 21st century! The Program Committee will give preference to presentations designed to engage the workshop audience, so proposals should contain a detailed explanation of both the substance of the presentation and the interactive methods to be employed. In addition, we would like to highlight talent across a spectrum of law schools and will look for variety in presentations and presenters. If you do not have a proposal to submit, but are interested in participating in a presentation, please contact Emily Randon (see below), as assistance with the overall workshop is always welcome. Based on participant numbers for the last several years, we anticipate over 100 people attending the program. To assist the presenters in the interactive piece, the program committee members and other volunteers will be on hand to act as facilitators with audience members. 2. A brief description of the objectives or outcomes of your presentation. 3. A brief description of how your presentation will support your stated objectives or outcomes. 4. The amount of time allocated for your presentation and for the interactive exercise. No single presenter should exceed 45 minutes in total time allowed. Presentations as short as 15 minutes will be acceptable. 5. A detailed description of how the presentation will be interactive. 6. Whether you plan to distribute handouts, use PowerPoint, or employ other technology. 8. Your school affiliation, title, courses taught, and contact information (include email address and telephone number). 9. Any articles or books that you have published describing the lesson you will be demonstrating. Send proposals by Monday, March 9, 2009 to Prof. Emily Randon, University of California, Davis School of Law, at the email address of elrandon@ucdavis.edu. If you have questions, feel free to contact Emily Randon directly at 530-752-3434. If you know of colleagues who are true innovators in techniques that achieve the objectives of the academic support community, please encourage them to submit proposals! 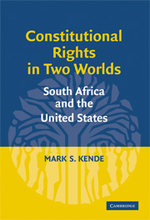 Mark Kende, Con Law Prof at Drake University, has a forthcoming book, Constitutional Rights in Two Worlds: South Africa and the United States, due next month, from Cambridge University Press. This book examines a crucial aspect of the South African transition: the Constitutional Court’s role in social change. The Court has enforced socioeconomic rights, supported gay marriage,and struck down the death penalty. How did the Court address these significant issues without much domestic human rights case law on which to draw? He gives his reasons for comparing the US and South African constitutional frameworks as including the fact that both constitutions were the product of revolutions and both high courts are foundational institutions. He notes the history of racism the two nations share as well as their present diversity, their common roots in British legal systems, and their original debates over the inclusion of rights in the Constitution. Yet he also does not shy away from the differences. The British legal system in South Africa was accompanied by the Dutch-Roman code, the racial minorities in South Africa are white, and the Constitution was framed by very different people in very different times in the two nations. scholars like Dennis Davis, Alfred Cockrell, Cathy Albertyn, and others write that the Court should be bolder and avoid a hazy minimalist “rainbow jurisprudence.” This view is startling given the Court’s novel decisions on socioeconomic rights, gay marriage, and the death penalty. Of course, South African progressivism ranges from those with a more individualist sensibility to those with a more African communal approach. But most South African legal academics advocate greater judicial activism . . . The Introduction promises an exploration of the South African Constitution Court's decisions on the death penalty, gender discrimination, "gay rights," racial discrimination, freedom of speech and religion, and perhaps most importantly socio-economic rights. With such an agenda, this book should be a stellar contribution to comparative constitutionalism. The Center for Constitutional Rights (CCR) is thrilled to announce human rights lawyer Bill Quigley of New Orleans will begin as its next Legal Director in May. Bill has been an extraordinary public interest lawyer for over 30 years, and has served as counsel on issues including post-Katrina social justice, public housing, voting rights, the death penalty, living wage, civil liberties, educational reform, constitutional rights, human rights work in Haiti, and civil disobedience. Bill has been an essential mainstay to social justice work in New Orleans before and after Katrina. CCR has lately been best known for its representation of Guantanamo detainees. An interesting profile of this work was published by Adam Liptak in the New York Times in 2004. William J. Jefferson, the former Louisiana Congressman indicted on 16 counts in his corruption case in the Eastern District of Virginia, asked the Supreme Court this week to reverse a Fourth Circuit decision refusing to dismiss his indictment because it was allegedly based on material that would violate the Speech and Debate Clause. I previously posted on the Fourth Circuit ruling (with a link to the ruling) here; Jefferson's cert. petition is here. Many thanks to Lyle Denniston at SCOTUSblog for posting this. Where Have All the Unitary Executives Gone? The NYT reports today that Republicans are furious over Senator Judd Gregg's withdrawal as President Obama's pick for Commerce Secretary, because they believe it signals that the White House intends to "politicize" the 2010 census. The concern in part relates to sampling, the statistical technique that extrapolates numbers based on actual door-to-door counts and knowledge of uncounted individuals, mostly the poor and racial and ethnic minorities (and mostly Democratic voters). But the Supreme Court ruled that sampling--at least as the basis for Congressional districting--violated the Census Act (Sec. 195) in the 1999 case Department of Commerce v. United States House. So the concern about "politicizing" the Census must be based on some other concern. But what? The Census Bureau is an office within the Department of Commerce; neither the Census Bureau nor the Department is "independent" (as evidenced by the Republicans' furor over Gregg's withdrawal). Any adherent to the unitary executive theory (like so many Republicans in the Bush II administration) should support, not oppose, White House control, in whatever form that comes. Moreover, even if the Obama administration intends to take more direct control over the Census Bureau and the 2010 census, this moves seems far more modest an assertion of executive authority than, say, Reagan's executive orders--EO 12291 and EO 12498--to centralize agency rule-making processes through OMB and to direct the substance of that review. Republicans lauded those moves and even the more recent moves of the Bush II administration sometimes stretching and even abusing the unitary executive theory. So where have all the unitary executives gone? With all the attention the theory received in the Bush administration, academic and otherwise, adherents and detractors alike should hope that it's more than just a passing political gambit so that we can debate it on its merits.